This easy, quick dinner is perfect for busy nights when you just don't have the time to cook fully from scratch. 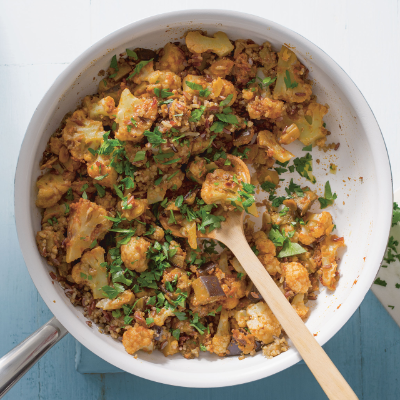 Using seasonal cauliflower, this vegan dish would also work well as a side dish, but is perfect on its own with a lovely warming glass of red wine. Seasonal comfort cooking at its best! 1. Cook the cauliflower in boiling water for 3-4 minutes, until just tender. Drain, reserving 100ml of the cooking liquid. 2. Meanwhile, heat the oil in a large pan and fry the aubergine for 4 minutes. 3. Add the almonds, tomato paste and cauliflower with the reserved cooking liquid and stir-fry for 1-2 minutes. 4. Cook the mixed grain pouch according to pack instructions, stir into the cauliflower mix and season to taste. Scatter with chopped parsley before serving. My kids love cauliflower. This recipe looks delicious and really easy to prepare. Will give it a try. More and more I'm seeing my food blogger friends convert over to vegan. While I love meatless foods, I just can't convert. This looks like a great dish and I'm trying it out! Vegan is definitely a trend that has come out of clean eating, but more and more people are going meat-free a few times a week for health and to save money. I've been vegetarian for over 30 years, but we have definitely been using less dairy since our daughters were born, it's not healthy to eat much. I'm sure sun-dried tomatoes are addictive! We get through jars of them here. That looks quite an easy and delicious recipe to make. Yummy! It's a great after-work meal. Great! Let us know how you get on. Yummy, this sounds like such a great recipe, I would love to try! Will enjoy this recipe. Looks easy and a great recipe. Good, a great one to add to the repertoire.